I made a grisly discovery a few days ago while cleaning out my car. There, among the crumpled roll film wrappers, empty film canisters, and discarded AA batteries I found my last roll of Ilford SFX. 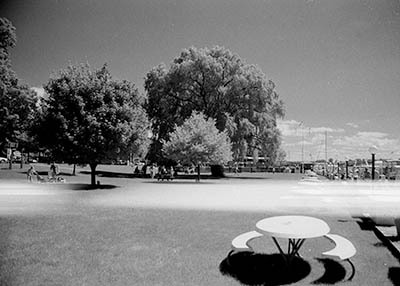 Not only was this my last roll of infrared film on hand, but probably the last roll of SFX I’ll ever shoot. The grisly part: it had sat in the hot car for at least a month, baking in the summer sun. And it gets worse from there. I popped the roll into a film camera that gets less use than it should, and set out to see if it perhaps survived the month of baking. Maybe, I dared to hope, it had even developed some cool, unique, far out effect that no one had ever stumbled onto before. Last Sunday was a clear and sunny day, perfect for IR shooting. I loaded up the camera and wandered around Saugatuck, Michigan, snapping away. Once I got home I developed the film and saw that it was indeed ruined. A large, over exposed band ran the length of the roll, slashing every frame (and even the space between frames) about one third of the way up. The more I looked at it, the more I began to wonder just how heat had done this, and then realized that the problem was most likely a sticky shutter blade. To confirm this I pulled a partial roll of macro Chm 400 out of another camera, and shot out the balance on the camera that had displayed the problem. Sure enough – the shutter is sticking, and that roll showed the same problem in the portion shot on the defective camera. So – one roll of SFX down the tubes, one camera heading off for repair, and oh yeah – the photos at the start of the roll of Chm 400 were finally developed. What the heck were those anyhow? On Friday I headed out to the Allegan forest yet again, hoping to get some final insect shots of the summer. The day was cool, cloudy, and dank. More than humid – dank. The air was hazy and it felt hot even though the temperatures were hovering below 80 F.
I started out at 125th street, near the river. This always seems like it would be a good spot for dragonflies, but never seems to deliver quite like I hope. Today there were no geese and no dead trout – and few insects other than small moths that I cannot identify. At the end of the trail along the river, where it heads upland and into a pine woods, I found a large bull thistle plant with two tattered swallowtails moving from flower to flower. One was pale and probably older, the other still had fresh vibrant colors in its wings. A got a few shots of them, plus a few shots of a blue dasher perching by the river. My ability to work with the dragonfly was limited since here was perching in the middle of a huge poison ivy spread. I don’t mind walking out onto the poison ivy, but kneeling down or crawling through it to get the right angle on the shot was just out of the question. There was more to be shot along the river, but the batteries on my *ist-D went dead, and of course I didn’t bring a spare. The camera is pretty energy efficient, getting 1300 to 1500 shots per set of AA lithiums. So it’s easy to just forget about batteries and wind up being surprised when they do poop out. I headed back to the car for replacement batteries, and decided to move along while there. I net hit one of the artificial oak savannas a short way down the road. As with the week before, there was one butterfly weed plant, still blooming this late in the season, but unlike the previous week there were few butterflies on it. Maybe one very tattered spicebush and a few tailed blues and coppers. I found one capper in a strange and listless position, and realized he was in the clutches of an ambush bug. Well, that’s the natural order of things, but I like the perky little copper butterflies, tiny dime sized creatures who stake out and defend their territories, and while the ambush bug has every right to eat, I’m always sadden to see a thing of beauty taken by them. After spending some time there – most of it probably fruitlessly shooting the savanna in B&W – I moved on again. This time I hit a clearing deep back in the woods, an area where karners and dragons are sometimes found, sometimes not. It looked like slim pickings on this day, but then out of the blue I looked down and saw a walking stick just sitting on the top of my camera. This was a real treat for me, since I had never seen one of these in the wild before. Apparently they are not particularly uncommon, but rather live out their lives at the top of the trees, out of sight and reach. After getting a few shots of the walking stick – including a close-up portrait of its head – I moved on for the final stop of the day, a field off 48th street. I almost said ‘a new field’ because it is a new spot for me. I’ve driven by it several times but, like many un-visited areas in the forest, never pulled over. So I stopped at this new place. It was mid afternoon, still gloomy. This field had some sort of tall grass growing in it, and was extremely sandy – with whole areas of just open sand, fitting for a beach. Maybe it was the time of day, maybe it was the weather, but there wasn’t much happening here. I did manage to get one nice shot of a living American Copper, staking out his territory on the edge of a sandy waste. When I got home I was surprized to find an adult ant lion, stuck in the remnants of a spider web on my back door. I pulled it out of the web, and snapped a shot of it on my thumb before it flew off into the back yard. And that may do it for the Allegan forest for a few weeks. I have other plans and conflicts in my schedule - I hope to make one or two more trips before the hunting season starts, at which time I’ll move on to other areas. As I mentioned in my last post, I spent the day last Friday ( a full week ago now) shooting in a field off 48th street in the Allegan forest. Aside from being a great location for insects, wildflowers, and feral garden flowers (vestiges of the days when this was a farm or some other sort of dwelling) this field has some of the best and largest Oak trees in the whole forest. That’s not really saying much – most of the Allegan forest is scrappy little lichen covered trees that seem to just barely eke out a meager existence in the sandy soil. There is something about this particular field, this particular stand of trees, that just speaks to me. Unfortunately, I don’t seem to understand the language, and so I return, time and time again, shooting the same area – sometimes from this angle, sometimes from that, sometimes early, sometimes late, sometimes in the spring, sometimes in the fall or summer. And while I’ve had some successes – Threshold Event and Tribute were both shot in this field – I have many more exposures that sit in storage – shots that don’t work, images that don’t connect. So, I’m pretty happy with this shot. It was taken with the Pentax 6x7 medium format camera on Maco IR 820c film, using a #25 red filter. The IR effect is pretty subdued, but I think it gives the shot a little more juice than plan B&W film would have. The shot is not perfect – it doesn’t display that well on the computer screen of course, since it draws its strength from detail most obvious in a large print. But the large print has several flat areas in the shadows of the tree foliage – areas that just since into dull gray with no pop or life. I’ve been working on very detailed localized contrast adjustments in Photoshop, and still entertain high hopes for the image. On a more whimsical, silly, and –ok – downright crude note: another interesting shot from the next is Nature’s Call, a heavily artifacted Holga shot of a commode (well, part of an out house) in the woods. Thankfully, it did not appear to have been recently used. That just highlights the odd nature of the Allegan forest. It’s a wild area, but embodies some of the most exploitive and crude interactions between humans and nature. You can see fabulous birds, outstanding wildlife, and spend an entire day off in the woods without ever meeting a soul; but then you can also spend your time walking on animal bones, shell casings, beer bottles and commodes, while gunfire cracks off in the distance. And somehow the place is cut off and isolated in time. There are very few clues remaining that hint at the farms that once were in this place, and virtually no hints of the old primeval forest. Instead there is the scrappy woods, trees uniformly 12 inches in diameter or less, and the artificial oak savannas that were carved out by bulldozers in recent years. In a few months deer hunting season will open, and the large parking areas that I visit so regularly, always the only car there, will be full of pickup trucks. And the sometimes woodsmen will get their few days of hunting it – and I’ll stay far away, waiting to return in the solitude of winter, and again next spring and summer. Yesterday and the day before I headed over to the Allegan forest for what may be one of the season’s last serious insect photography trips. I had intended to visit some other areas – Yankee Springs and Fort Custer in particular – but opted instead to return to the familiar woods. I took a very different approach on each of the two days. On Friday – the first day out – I more or less stayed in one large field off 48th street. On the second day out I took a more mobile approach, taking the two track along the river, stopping at several locations that have been productive in the past, and then moving back along 46th street, hitting four or five other spots, some more frequently visited than others. I finally closed out the day with a return trip to the field on 48th street, before heading home late in the afternoon. The field on 48th street, where I spent most of Friday, has been the source of some interesting landscape shots. I’ve posted a few comments about this field thus far this year. It’s a place that really speaks to me, though I struggle to understand just what it is saying. It’s a place that combines the wilds of the large woods / savanna / Pine Barrens with clues and elements of its human past. Last year around this time the entire field was ‘mowed’ – I put the word in quotes because mowing doesn’t fully describe the aggressive cropping the field received, with every tree or sapling less than three inches in diameter chopped (ripped) at ground level. I don’t know if this is an annual thing or not, but it makes me appreciate the now recovered field all the more. Red Meadowhawks are now out in force. Be they Saffron Winged, Ruby, or White Faced Meadowhawks, the arrival of the bright red dragons is a sure sign that summer has reached its apex. These will be the last of the dragonflies, flying for another month or more depending on the weather. This particular field has a small parking area off the road, the basically puts you on the north west corner of the long open meadow. There is a slight rise as you walk back into the field from the parking area, and a hundred yards or so due east puts you on the top of a small sandy hill. From that point on the field gently rolls downward, both to the north east and to the south. A mixed pine and hardwood forest borders the east edge of the field. At the south end is a small marsh, now more or less over grown. Last year I could not walk into the marsh – I’d sink in the mud – but this year must be drier, because I can walk across it, the dried plants holding up my weight. There’s still enough water to make my pant legs wet when I drop to my hands and knees to get an interesting insect shot, and there is still a very small pond of open water – just a few square feet, mostly just much now, but still sporting some cattails, calamus, and other water loving plants. When shooting insects here I basically follow the periphery, moving a short distance north along the scrub that boarders the road, and the following the northern wooded edge till I’m more or less in the middle of the field, at which time I walk due south, ultimately ending in the marsh. The types of insects found vary greatly with the locale. The red Meadowhawks were mostly in the high, sandy, and dry areas, though some were down in the marsh. The north end of the field was full of wildflowers, and late in the day, returning back through this area on my way out, I found lots of Spicebush butterflies – literally dozens – and the occasional tiger swallowtail and fritillary. As I mentioned, the second day was a series of short visits to diverse areas. Many of the small clearings off the two tracks in the woods were unproductive. In the past I’ve found lots of dragonflies, cicada killers, and other subjects in these areas. On this day I found few subjects at all. The open fields and cultivated savannas were more productive. In the first large field I ventured into I found one small clump of butterfly weed still in bloom. It was covered with Spicebush butterflies, with anywhere from 8 to 12 on it at any given time. It’s late in the year, and the birds have certainly taken their toll on the Spicebush butterflies. Between the two days I saw dozens of individual subjects, and virtually everyone had one or more wing clipped, and most had the dusty dark brown color that they get when they get older. I also ventured back into another small clearing, this one on the edge of a large area that was clear cut a few years ago and now is returning to a lupine / oak savanna setting. In this clearing I met a downright stubborn 12 Spotted Skimmer, who returned to the same perch over and over, and was there after I made and extended hike into the woods and back, almost an hour later. Well, he gave me the opportunity to get a few nice shots of him as he perched there, and I even tried some Holga close-ups of him, but I hadn’t brought any close up diopters so the shots were not successful. Overall, the two days were fairly productive in regards to insect shots. I had hoped to get a shot of some cicadas, and while I saw a few in the low branches of some trees, they were successfully eluded me. I also hoped for some late season shots of Karner Blues (its very late in the season for them) but saw no sign of any Karners are all – though eastern-tailed blues were quite abundant. I also devoted some time to oberving Green Darners, a large and beautifully colerful dragonfly that seems to spend most of its time hovering above fields. It does not perch and display like pennants and skimmers, but I learned that they ulitmately do sink down and take a perch low to the ground after flying for a while. I managed to get a couple documentary shots of these dragonflies - nothing very compelling but competent shots. At this point I still have two rolls of 120 B&W film to processes, after which I’ll be scanning and posting more on the results of the landscape shoot from Friday. Yesterday I posted a handful of new toy camera shots. These shots were taken either with a Holga camera, or with another 35mm Special Moments dollar store camera. I’m back to working a (more or less) full time day job, and so I have to resort to grabbing photos whenever possible. Toy cameras are perfect for these – keep one under the seat of your car and pull it out whenever a scene or moment speaks to you. For one thing, the sunflower was an initial experiment in Holga close-ups. To take it I put a series of close up diopters over the Holga’s lens, using a ombined +4, +2, and +1 set. These are pretty inexpensive close-up filters, and so they probably distort the shot a bit. But hey, its a Holga. In theory.... The great thing about working with the Holga is that you really never know what you are going to get. And, even with the close up filters and shooting just a few inches from the subject, the wide angle lens on the Holga seems to make it almost impossible to get a clean background, free from distractions. The Laundry in Galesburg is another Holga shot. Since I have a fairly long commute I’ve taken to shooting while driving. (I’m working on setting up and in-car photoshop installation so I can edit files while driving, but that may prove to be impractical.) I made a beer run on the way home from work, and the slight jog to the market turned into taking the back roads home. Galesburg is a small town, I’ve driven through it many times when driving back and forth to the Fort Custer Recreation Area, a favorite nature site a few years ago. Sitting at the stop light the late afternoon sun was sneaking in the back door of the empty laundry. This was at the height of the heat wave here in Michigan, which probably explained why the laundry was empty and the back door was propped open. But the light and the reflections were engaging, and I had just enough time to grab the Holga, hold it blindly to the passanger side window, and shoot. I never even looked through the finder, but the shot seems to have framed itself up well enough. I like the overall akimbo composition, and especially the glimmer of the Stars and Strips in the window pane above the door, just below the peeling paint. The last of the three new shots posted was taken with another Dollar Store Special Moments 35mm film camera. I figured that now that I have a job, I can splurge and buy more photographic gear. And so I wound up buying 5 Special Moments cameras – three more of the standard wide angles, and two of the silver ‘sports’ models. I was curious to see if they were all the same optically, or if they each had their own feel and flavor. In the worst case, I could always dissect one or two, just to see what was inside, and maybe mount the plastic lenses on one of the old TLR’s I have on hand with fogged or missing lenses. It seems that each camera is indeed pretty unique. I pulled out the all black one because it looks more serious than the pink one I’ve been using. It gets this remarkable iris-like flare effect when the sun hits the lens, the film tends to warp in the chamber (giving the images a bent look to them) and the winding mechanism overlaps frames to the point of near double exposures. Wow – what a great camera. I took a few pictures of trees reflected in the river, and really like the effect. Maybe in the fall I’ll try some color film in it. The Holga shots were taken on Cassic Pan 200 and 400. I developed both variants in HC-110 Dilution B for 9 minutes, 68 degrees, normal agitation. This produced a beefy enough negetive with both varients of the film (the Holga almost always requires a good push in the developing stages) and also brought out some pretty pronounced grain (which I like.) The 35mm shot was taken on Tri-X, developed in HC110 Dil H.
The digital scans are toned with the indigo tritone I originally cooked up for the Chicago street photography entry, and which has become (for the time) a favorite tone for mono shots. Summer is in full swing here in west Michigan. The days are not as long as they used to be, but they sometimes make up for their shortened duration with intensified heat. Tis is the time of year where the lush green of early summer takes on a brown tint. This is the time of year when a few leaves from the more stressed tress start to rattle about on the sidewalks and dirt roads, foreshadowing the great rustle of fallen leaves to come in the fall. This is the time of year when the flower wilts, though the foliage remains fulsh and full. It’s high summer – the dog star is barking. The birds still sing, but with a mean edge to their song, and not with the rejoicing of spring. Hey – it’s August 7, why am I writing about winter? I’m behind on my blogging. Last Friday I went out to the Allegan forest, my weekly trip to see what was happening. It was the first cool day after a week long, brutal heat wave. The heat had broken with strong storms and lots of rain, and so the sandy soil in Allegan was still damp, the plants in the barrens and savannas were still green. As a day of photography it was pretty unremarkable and unproductive. I got a few shots of of an Eastern Tailed Blue, and a single dragonfly shot. I started the visit with a trip to the barrens off 46th street, which in the spring is a riot of coreopsis. There always seems to be a second, lessor wave of coreopsis in late summer, and a few of the yellow flowers punctuated the green brown of the fields. Although the heat wave had broken, it was still quite warm out in the midday sun. The edge of this field has a large area of cottonwood saplings – home to many nesting indigo buntings and other birds. The saplings are pretty uniform at about 12 feet high. Their leaves make a rubbery, slapping sound when a good breeze rustles through them. This is the time of year when cicada come out in force, and in this particular field there are always abundant cicada, not high up in the trees but down low, hanging off the branches of the smaller saplings or lumbering up out of the grasses and weeds. Usually I see them as they fly away – they often rattle against the leaves of whatever plant they are leaving, and then buzz away, making a deep, loud, buzzzzzzz as they lumber off. I saw several on the branches of some of the small oaks and boarding cottonwoods, but they invariably flew off as I approached – so, no photos. On Saturday I taught a summer photography workshop at the Pierce Creek Center. I had planned to go out shooting with the group afterwards, but things ran a little late (in case you haven’t noticed I can be long winded) and I spent the time after the class talking with some of the folks who had attended. Packing up after the workshop, I saw dozens of cicada killers working a strip of weedy prairie between the parking lot and the road in. This little berm of earth was no more than 10 or 15 feet wide, but was home to dozens of the cicada killers who had evacuated large warrens in the sandy soil. One female flew by with a paralyzed cicada in tow – looking as large as a hummingbird or chickadee. Over the rest of the weekend, here at home, I broke out the insect setup and shot some of the thread waisted wasps and hornets that congregate on the flowing spearmint that grows along the fence line in my little urban yard. I’m not a big fan of the mint – it’s aggressive and relentless as it spreads. But my house is just a mile or two of the AM Todd factory, and this area was no doubt host to many mint farms in the past. While these plants may just be wild vagrants, they may also be a bit of testimony to the history of the local area. In any event, two large clusters of gray coneflower are now sprawling in the mint patch – and I’ll put my money on the hearty prairie plants to succeed. Good new arrived Saturday with notification that two of my photos have been accepted into the Maryland Federation of Art Sixth Annual American Landscapes exhibit, which will be running at the MFA Circle Gallery, in Annapolis from September 8 through October 14, 2006. I had a piece in the fourth exhibit (did not get in last year) and had a great time visiting Annapolis. I consider my landscape work to be the most serious stuff I shoot. I don’t shoot that much of it, and prsent even less mostly because the opportunity isn’t there and it's hard to do. It’s not that I’m not out working, or that I forget my cameras or something – it’s rare that the land speaks to me coherently, showing me the shot to be taken. It get incoherent messages all the time, and unlike the “Outer Limits” the problem is definitely with the receiver…. Doing landscapes in the Midwest is not an easy task – you don’t have grand panoramic scenes, fabulous mountains, or other natural wonders that are slam dunks for landscape shooters. During my recent trip to North Carolina I felt like Gomer Pile, saying “Golly – look at those mountains.” Mountains, valleys, canyons, gorges, heck – even lighthouses – all offer some degree of pizzazz to an image. The subject is possibly the most basic aspect of any photo, and Mount Rushmore will usually have more impact than, say, Michigan’s Bald Mountain, no matter what. Let’s face it – shooting landscapes in the Midwest means a lot of flat plains, loads of trees, and a sun that sometimes shines, but often hides behind a thick layer of clouds. But then, all around the world rare and inaccessible places are becoming less rare and more accessible every day. A couple generations ago the Everglades were a true wilderness, now they are a tourist attraction. Denali was once a remote frontier, now it is an air fare and hotel ticket away. I’d suspect that here in the modern world it’s all pretty easy to get to where you want to go whenever you want to get there. Which is no doubt why some of the prime photographic locations in the great national parks out west have photographers lined up dozens deep, all shooting the same old shot. Well, Nietzsche tended to get overly dramatic, but his point is well taken. To see the beauty in a brownfield - or a little spit of midwestern woods or prairie - is an attribute of the awakened consciousness. And so I’m proud and honored to have Weedy Sassafras and Use and Lose represented in the Maryland show. I have been a stranger to the old farmstead in the latter shot, but frequently visit the bit of oak savanna where Weedy Sassafras was shot, and it’s one of the few areas of the maze like woods where I don’t need the GPS, because I recognize each tree individually. Yesterday I decided to visit the Pierce Cedar Creek Institute for Environmental Education to check out the opportunities for some general insect photography. Despite its high sounding name, the Pierce Creek Institute is basically a nature preserve, with hundreds of acres of forest, restored prairie areas, and wetlands. An extensive trail system covers the grounds, and in an afternoon (if you hike quickly) you can cover all sorts of terrain and microenvironments. I’ll be conducting a photography workshop at Pierce Creek next Saturday, focusing on summer photographic subjects. This is a follow up on the winter photography workshop we held last January – and hopefully the weather and subject matter will be more inviting. Once again, the weather did not cooperate. The day was predicted to be sunny and hot, but was overcast, muggy, and hazy in the morning. I drove out to Pierce Creek (about 45 minutes from Kalamazoo) in hopes that things would clear by the time I arrived – but it took over an hour until, at around noon, the sun finally started to break through and temperatures soared. The restored prairie areas were thick with dragonflies and other insects. As usual, the challenge was to get a good shot with a clean background – and also as usually the perching pennant dragons were the easiest to work with. The forested areas were, as expected, must less productive. There were a few clearings where I crawled around after meadowhawks (later to realize I was crawling in poison-ivy), but in general the prairie areas were by far the most productive. Aside from the dragonflies the most interesting observations of they day included an American Painted Lady, Giant Swallowtail, and Cicada Killer – who was foraging on a Queen Ann’s Lace Flower and wasn’t out killing cicadas at all.